The Grandstand T.V. Game 3000 is a classic pong system sold in U.K. It can be also found under different other brands worldwide. It's in fact the same model as the T.V. 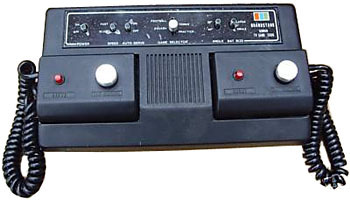 Game Model 2000 but with a colour display (Model 3000 is in black & white). The system itself seems to have been made in Korea. The electronic board is labeled "F'GAMATIC-7600". Indeed many Gamatic 7600 systems identical to this one can be found worldwide, the earliest one being a japanese Gamatic 7600 system released in 1976. The case design is not particularly original: black rectangle with two detachable controllers and a wide control panel at the top. The controllers are also rectangular with a dial to move the bat on screen and a red button each, one to serve (left player) and the other to reset the game (right player). On the control panel can be found the usual setting switches: ball speed (slow/fast), automatic service (on/off), game selection, rebound angle (20�/40�), bat size (small/big) and power switch. The system can be powered by six CM2 battery cells or through an external power supply (9v DC, 360 mW). see more Grandstand T.V. Game Model 3000 Ebay auctions !